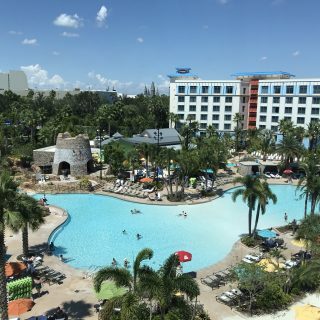 The question I get asked the most is “What’s there for the little ones to do at Walt Disney World?” There’s a perception that Walt Disney World is just an amusement park. 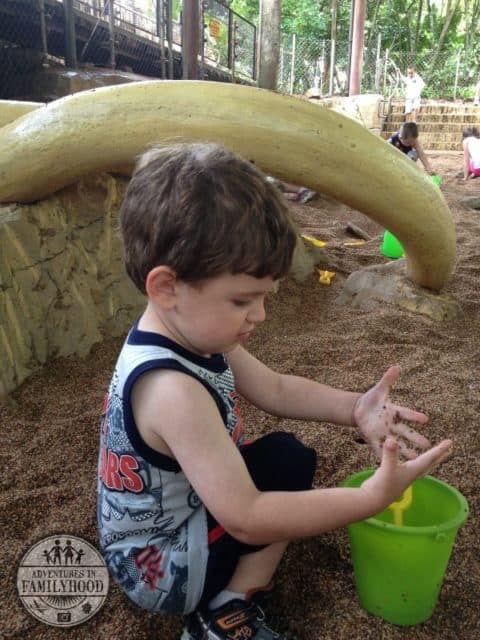 Because of that idea, many parents assume that it’s not appropriate for kids under 3. They think the only rides they’ll find are roller coasters and thrill rides and that there will be nothing for their little ones to do. That couldn’t be farther from the truth. 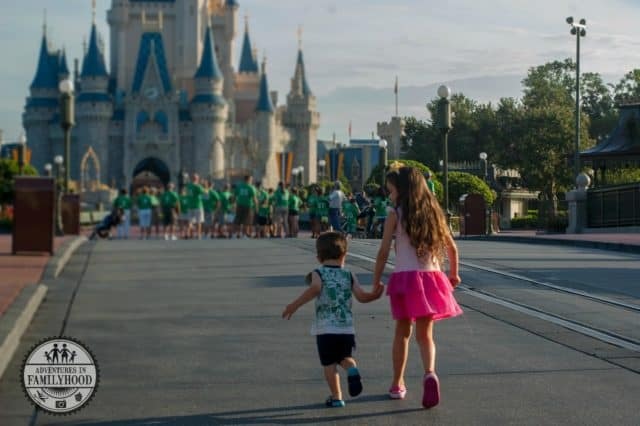 Walt Disney World is a place for everyone, especially little ones. In the beginning, Disneyland, the first Disney Park, was created as a place where parents and children can do things together. Classic rides such as “it’s a small world” and Dumbo were designed so that adults could ride with their kids. The same thinking went into Walt Disney World. The majority of the rides are suitable for all ages. And don’t forget the attractions! 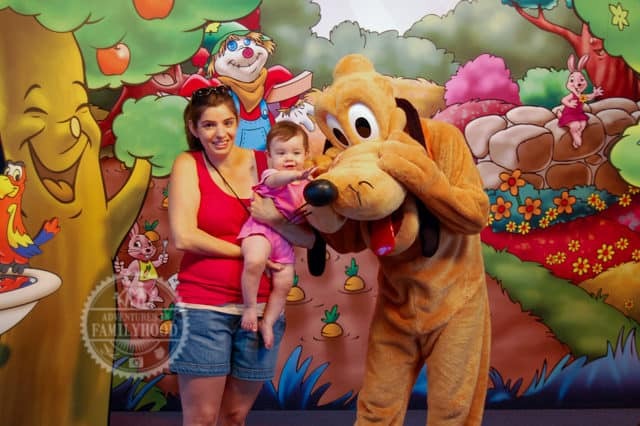 With so much to do, you’ll forget why you hesitated bringing your little one to Walt Disney World in the first place. I’ve consulted the experts (aka my kids) and came up with a list of must-dos for each park. While there is so much more to do than what’s mentioned here, these are the experiences that you shouldn’t miss. 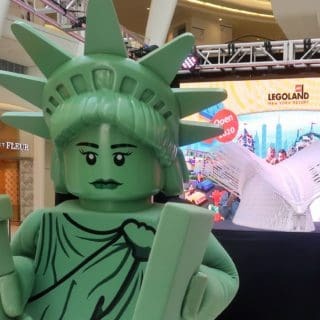 They will bring kids up close and personal with their favorite characters, open their minds to a world of imagination and get them ready to discover new places and things. 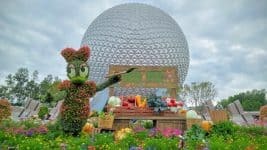 Here are my suggestions for the Best Rides and Attractions for kids 3 and under at Walt Disney World. Disney’a Hollywood Studios is currently going through a massive overhaul. 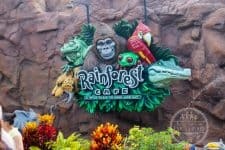 Despite that, there are still some great rides and attractions that the little one will enjoy, especially if they are Disney Junior fans. 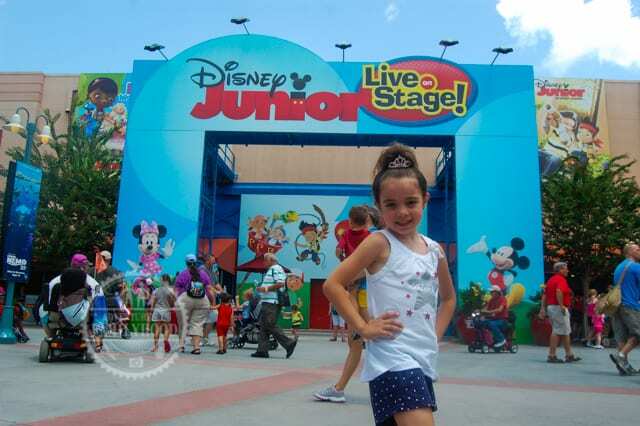 Disney Junior-Live on Stage ~ Sing and dance with Mickey and all his Disney Junior pals. For the First Time in Forever: A Frozen Sing-Along ~ Join friends from Frozen for this really cool interactive sing along. Voyage of the Little Mermaid ~ Relive all of of the favorite moments from The Little Mermaid through live action performances, puppets and special effects. Meeting Pluto, 7 months old. 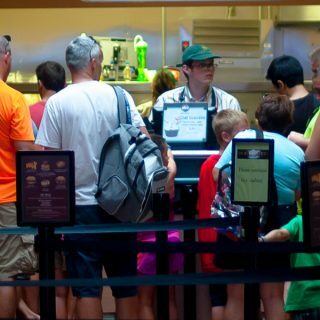 Most people count Epcot out as a place to take the little ones. We always found it to be the best park for character greetings and a way to expose our kids to new cultures. The Seas with Nemo and Friends (Future World)~ Ride along with characters from Disney/Pixar’s Finding Nemo. Don’t forget to check out Nemo and all his friends in Undersea Observation area. 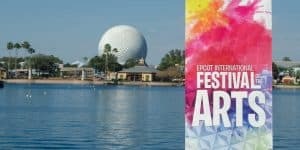 Journey into Imagination (Future World)~ Follow Figment on a fun filled Open House tour. Epcot Character Spot (Future World)~ Meet and Greet with Mickey, Minnie and Goofy. Frozen Ever After (World Showcase, Norway) ~ Sail through Arendelle. See Anna and Elsa and all their Frozen friends. Kidcot Fun Stops (World Showcase)~Collect activity cards from each country in a cute Ziploc suitcase bag. Collect them all to earn a special prize. 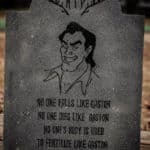 Your animal loving kids will LOVE this park. My kids could spend hours exploring the animal trails or digging for dinosaur bones in The Boneyard. Kilamanjaro Safaris (Africa) ~ Take a safari through the African savanna. Be on the look out for elephants, zebras and lions. Festival of the Lion King (Africa)~ Celebrate the circle of life with this colorful, Broadway style show. Adventurers Outpost (Discovery Island)~ Meet Mickey and Minnie before they head out on safari. TriceraTop Spin (Dinoland U.S.A.)~ Think Dumbo meets Dinosaurs. You’ll fly high over Dinoland U.S.A in your own dinosaur. The Boneyard (Dinoland U.S.A)~ Kids will love exploring and having fun in this dinosaur dig-site playground (it’s also a great place to take a break). Maharajah Jungle Trek (Asia)~ Explore this animal trail in search of tigers, bats and exotic birds. 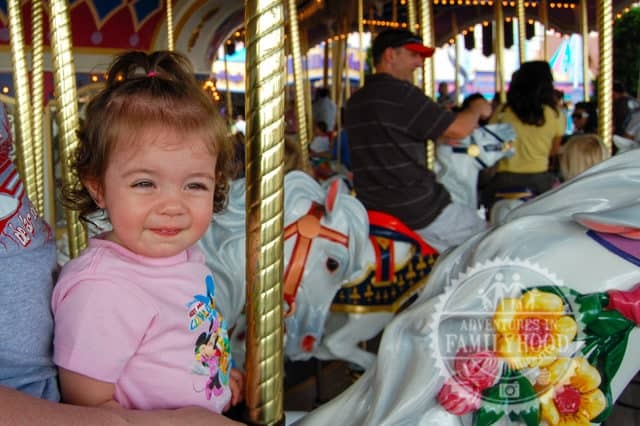 Bella on the Carousel at 15 months old. The Magic Kingdom is THE place for little ones. With so many rides and attractions it was hard to narrow down. The ones I’ve listed are much loved family favorites, that even to this day, are still requested by my kids. it’s a small world~ Between the colors and the music, your little one will love this classic boat ride. The Many Adventures of Winnie the Pooh~ See Pooh and all his pals as you travel in a honey pot through the Hundred Acre Wood. Dumbo ~ Fly high above Fantasyland in your very own flying elephant. Take some time to play in the indoor playground before heading on the ride. Princess Fairytale Hall~ Little princesses will love meeting their favorite Disney princesses! Prince Charming Regal Carousel~Who doesn’t love a merry-go-round? Under the Sea- Journey of the Little Mermaid ~Travel under the sea for a musical adventure with Ariel and her friends. Walt Disney World Railroad~ Hop aboard a steam train for a grand circle tour of the Magic Kingdom. Festival of Fantasy Parade~Everyday at 3, the Magic Kingdom comes alive with beautiful floats, magical characters and fun music. Be sure to grab a spot early to get a great view. These suggestions are just the tip of the iceberg. Depending on your child’s personal preferences and height, there are so many more rides and attractions suitable for them. 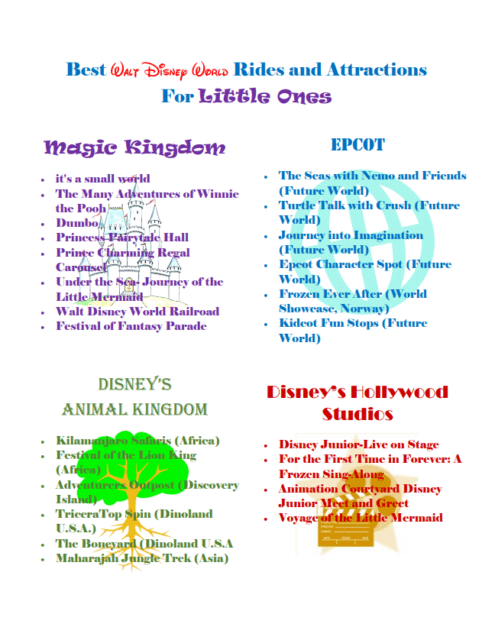 Download our printable version of Best Walt Disney World Rides and Attractions for Little Ones . 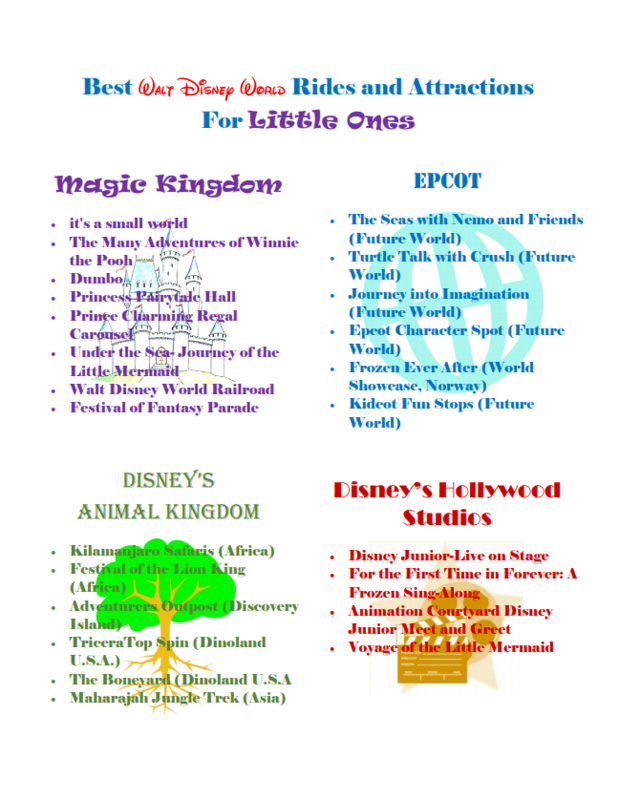 Add this printable to your travel binder or use it as a checklist to take with you to the parks.